It was an unconventional start time at Palm Springs Stadium as the Bootleggers and Bluesox kicked off Saturday’s quadruple header at 8:30 AM. The starter for the Bootleggers, Matt Fleishman, struggled with his control in his inning and two thirds pitched. Fleishman escaped trouble in the bottom of the first after three walks loaded the bases, as Garret Scarborough grounded into an inning ending fielders choice. Walks would end up being the downfall for the Bootleggers and Fleishman, as the first four Bluesox reached base via the walk thus driving in the first run. Michael Lynch followed that with a two RBI single. One run was all it would take on this day as the Bootlegger bats were stymied by the opposing starter for the second day in a row. A day after Josh Graves pitched five shutout innings against Bay Area, Christopher DeBoo and Chris Pfau combined to shutout the Bootleggers in a 4-0 Washington win. In the second game of Saturday’s quadruple header at historic Palm Springs Stadium, pitching was the defining theme of the matchup between the British Columbia Bombers and the Palm Springs Power. After a slow start to the season, the Bombers have begun to pick up their play. Bombers southpaw Christopher Rice was masterful in his start Saturday. In his 4 innings pitched, Rice struck out 8 while only allowing one run. He and reliever Kentrel Pierce combined to strike out 12 Power batters overall. After British Columbia scored 2 in the third and 1 in the fourth, it was a tight game throughout until the Bombers added some insurance runs in the top of the seventh. The extra breathing room was more than enough, as the Bombers defeated the Power 5-1 for British Columbia’s second consecutive victory. Nick Woodward and Matt Broder combined to shutout the red-hot Chill. Woodward struck out six and allowed only one hit in his four innings of work before giving way to Broder who went the final three innings to earn the save. All the scoring came in the bottom of the third inning for the Haymakers. After Justin Girton drew a leadoff walk, Kyle Peterson was hit by a pitch and Brian Bistagne followed up with an RBI single to score the first run of the game. Two strikeouts followed, but pitcher Fred Luchetti couldn’t handle a comebacker off the bat of Rudy Luna and Taylor Jockers continued the damage with an RBI single. By the time the inning was over the Haymakers had built a 4-0 that would stand the rest of the way. 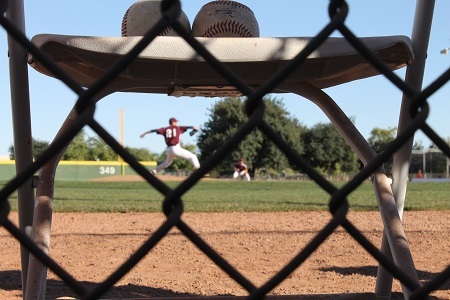 The Lumberjacks and Snowbirds were locked in a pitchers duel throughout their 4 o’clock game. Willaim Patterson pitched five innings giving up zero runs to get the win for the Lumberjacks. The only offense of the day was on a Vincent Difazio solo homerun to leadoff the third inning. Difazio added a double in the fifth and finished 2-3 with the lone RBI and run of the day. Timothy Vander Harr pitched two innings striking out the first four batters he saw. Wacey Sorenson relieved Vander Haar in the third inning giving up the lone run of the day and receiving the loss.